Pikachu, the iconic Pokémon from Pocket Monsters, looks slightly different these days. Adorable, sure, but not nearly as adorable as in 1997, back when the Pokémon anime first debuted. Not nearly as fat, either. 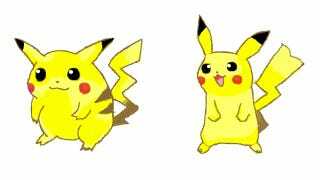 Over the weekend, a thread called "Pikachu in the early days was way too cute" (初期のピカチュウかわいすぎ) appeared on 2ch, Japan's largest web forum. Net users posted images from the first few anime episodes, showing just how different the round and cuddly Pikachu of yesteryear looked. This thread isn't the first to notice Pikachu's altered appearance in the anime—and the games. For a while now, Pokémon fans have been pointing out just how different the character now looks. There's even a "Pikachu: Losing Weight Since 1998" image that's been floating around the internet for donkey's yonks. Website ScrewAttack thought the change might be because Pokémon's creators want a fitter Pikachu—a theory that doesn't really hold water when you consider all the Pokémon-branded junk food Japan sees. Nor if you look at the very round Doraemon, Japan's favorite cartoon cat robot. The answer is probably a lot more simple: Over time, animated characters change. Just look at Mickey Mouse. "Oh, wow, this really takes me back," wrote one net user. "Pikachu these days seems over-refined," added another. "Pikachu was more cute and cuddly. Now, Pikachu is a little too thin and scary."